This is a large old country house, situated in the heart of the Armuña and 7 km from Salamanca, in the Castilian village of Moriscos. The restoration work on the building has been carried out preserving all the original features that we have been able to recover (14th century columns, 16th century wooden doors...) and using the fine materials that go perfectly with the house, maintaining the actual style of the area and bringing out those features that were once hidden and can now be seen, such as the stone walls. Among its areas, it has a patio with granite stone 14th century columns, where we can enjoy the freshness of the ivy and the decorations with its large earthenware jars. This leads us to the porch and on to the lounge, a spacious room that still has the original stone walls and where we can sit in one of the leather armchairs and enjoy the warmth of the large modern fireplace, made of granite stone. 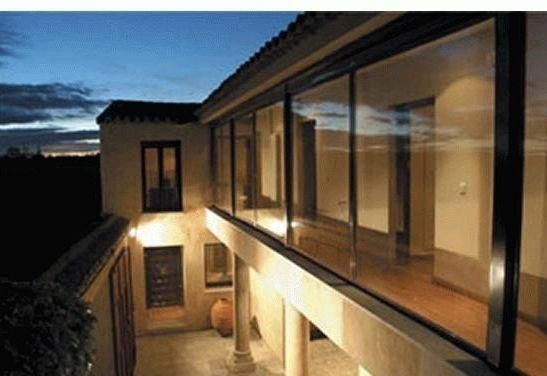 Because of its thick stone walls, the windowed porch keeps in the warmth in the winter and the coolness in the summer. From here, we go up a granite stone staircase to the windowed gallery and the bedrooms, from where we can watch the sunrises and enjoy the different colours offered by the passing of the seasons, and also the warm sunsets. Come and experience the peace and quiet of the Salamanca Armuña, with the advantage of being only 10 minutes away from the Plaza Mayor or Main Square in Salamanca. Estamos encantados de haberos conocido y tenido como clientes. Nos agrada que hayais estado bien. Da gusto tener clientes como vosotras. Esperamos volver a veros .